Mosaics vary in shape and size, colours, material and use. Some are created for placing indoors, some outdoors. Some are to be walled, some can be installed into the floor, some others can be hung. It is important to know what you prefer and require, according to your own taste and available space, before making a commission. ​ 'Gabriel Mosaics' works mainly with glass, ceramic and antislip swimming pool tiles (for wet environments such as showers flooring). The very first thing to do is decide whether the mosaic will live hereafter indoors or outdoors, as the materials needed to assemble it differ enormously. 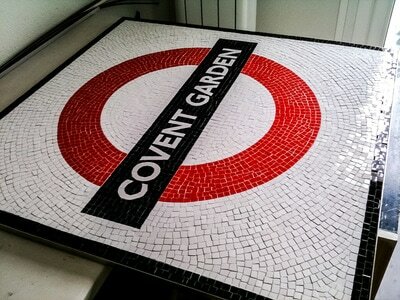 ​indoor mosaics - these can be walled, floored or hanged. The main thing to remember regarding hanging a mosaic is its overall weight and for this reason most will need steel mounting brackets onto which the base (and if big the sides too) can be settled. Please remember that a mosaic attracts people to touch it, and the weight of a hung mosaic which gets even sligthly moved every now and then will eventually disrupt both its hanging means above and the nails these are hooked upon. A weak hanging will possibly result in a broken mosaic and surely a nasty dent or damage to the floor below it. Mosaics which can be hung are the heaviest of all, as they have a hefty backboard onto which they are glued fitted into a stainless steel 'armour', and such a support cannot be featherweight if one wants the mosaic to last a very long time. 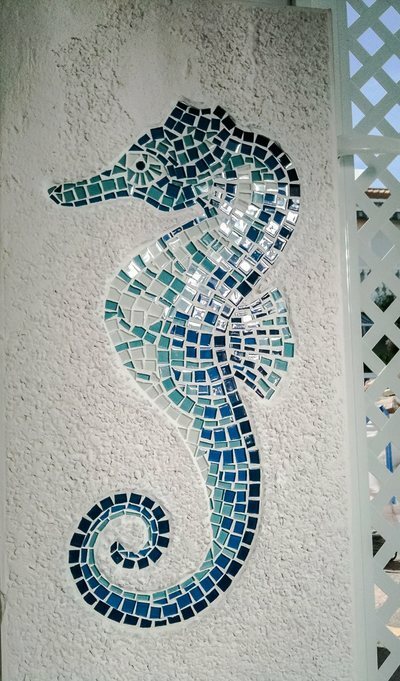 outdoor mosaics - these can be walled or set into the floor. The materials used to set it in its location are waterproof. The ideal place where to set an outdoor mosaic is the one which will unlikely be brushed past, accidentally hit or covered in any way, meaning that walling a mosaic right behind where one throws wood or garden tools or a bicycle is not a very good idea. If more than a suitable place is found, it is best to choose the one which will receive the most light, especially if the mosaic is made of glass. A mosaic can have any shape at all as the tiles used to make it are very small, allowing much room for creativity. Whichever shape and size, however, will need to fit on the wall or floor it is intended for, therefore precise measuring is essential. 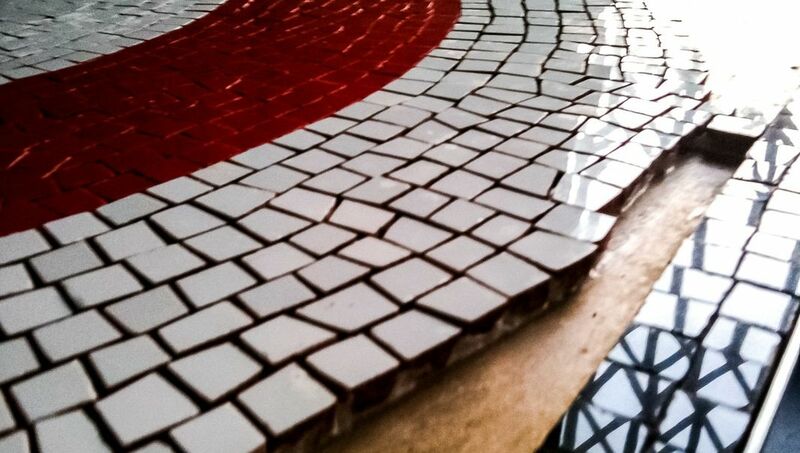 Mosaics are made of heavy materials, which doubles and even trebles once glues, grouts and concretes are included. The weight factor must be taken into consideration when thinking of hanging or walling a mosaic, unless very small in size. Colour choice is unlimited, each mosaic can be created to suit your personal taste regarding all different colours and their nuances. Clearly, a choice of colours which mingle well is the best choice for an effective final result. It is also wise to consider the main other colours already in its immediate surroundings, so that the one will not clash with the others. Mosaics are magic, but the way they are made hold no more secrets for you now! 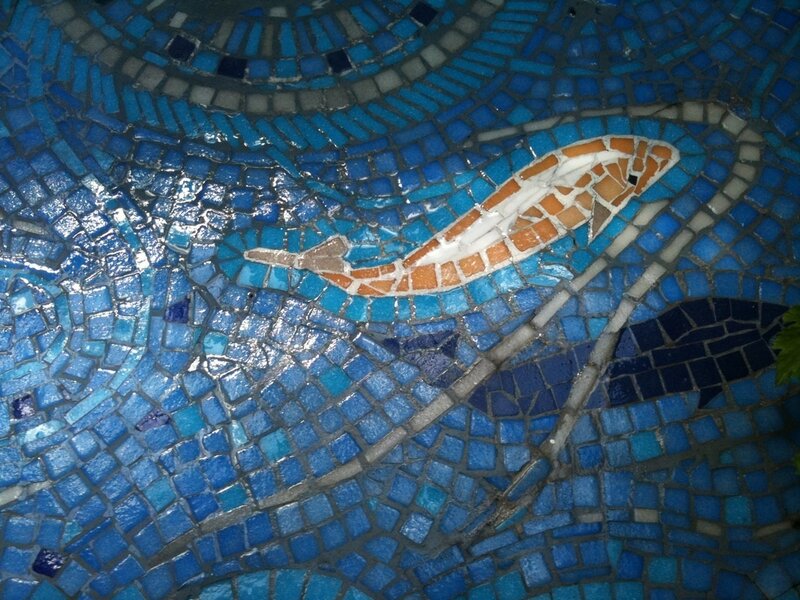 Go right here and tell us all about your dream mosaic!